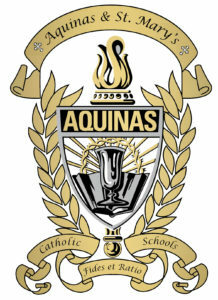 Aquinas and St. Mary’s is blessed by all the donated gifts of time, talent, and treasure that we receive everyday. We need and appreciate each and every one of them. Whether you serve on a committee or board, make a donation of cash or grain, offer prayers and sacrifices, or volunteer using the talents you have, we just wouldn’t be the same without your gifts. In turn, your example of generosity helps to teach our students the importance of gifting time, talent, and treasure. There are many ways to give to Aquinas & St. Mary’s: through the Annual Appeal, Gold Rush, or by giving of their time to serve on different boards. You can leave your legacy with a bequest or named fund within The Endowment Fund. We ask that you continue to pray for us as we strive each day to educate our youth in a Christ-centered learning environment in order to prepare them for their future in the church, their family and in civic responsibility. This is our mission. This is our prayer. If you have any questions, please contact the Development Office at 402-367-3175.